In a bowl, whisk together garlic, shallot, juniper berries, balsamic vinegar, olive oil, red wine and rosemary. Remove all silver skin from venison and marinate for 5-8 hours in the refrigerator. During the last two hours, take venison out of the refrigerator to allow meat to come to room temperature. Prepare grill or pan to medium-high heat. Remove meat from marinade and pat dry with paper towels. 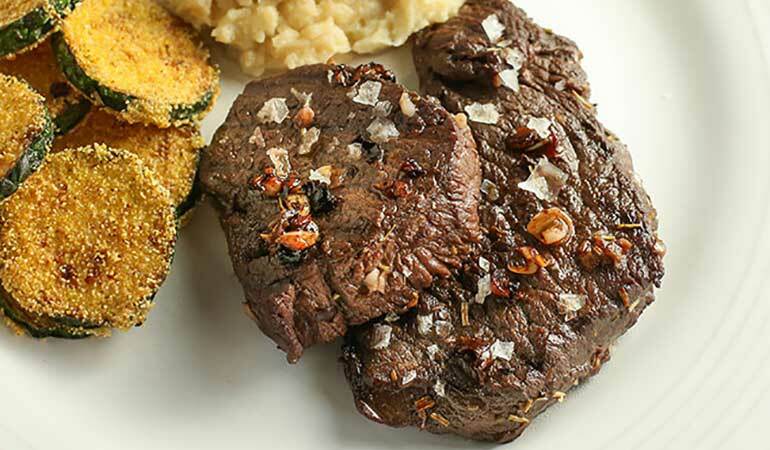 Sprinkle steaks liberally with salt and pepper to taste. If you're going to grill the steaks, brush oil all over steaks and onto grill grates. If pan searing, cover bottom of the pan with 2 teaspoons of oil. Sear steaks in a hot pan for 2-3 minutes on each side for medium rare. For grilling, cook steaks for 3-5 minutes on each side. Allow meat to rest for 5 minutes and then serve. These steaks came from a big, old deer shot by a friend. He had no interest in eating it, so he practically gave us the whole deer, neatly processed and packaged. While the ground venison was delicious, the packages of steaks have been difficult to get through. I like a bit of chew in my meat, but sadly, these steaks resemble shoe leather, even when cooked rare. So this time around, I was able to plan ahead a bit. Aging greatly benefits venison. Rick and I try to dry age all the deer we shoot. But when meat is given to you already processed and frozen, what do you do? Wet aging is the answer, and I believe it greatly improved these steaks. I defrosted the steaks on a Wednesday morning and didn't cook them until Sunday night. During that time, they remained vacuum-sealed in the refrigerator. The vacuum packaging keeps air out and moisture in, thus keeping the meat red and preventing moisture loss in a dry refrigerator. This gives the meat's natural enzymes time to break down tissue, which tenderizes the meat. I let these steaks sit for a total 4 days, but they could've easily gone for 4 more. I'm going to have to further experiment to see how many days is optimal for this particular deer. Not only were these steaks wet aged, they were also then marinated in this juniper, balsamic and wine marinade recipe. The acidity in the marinade further tenderizes the meat. This is a winning combination to make tough deer more palatable. As for wine, I used the Vidigal Porta 6 red wine from Lisbon, Portugal, which I found at Trader Joes for under $7. It's a medium-body red wine, lighter than I'd usually choose for venison. However, intense dark cherry and spicy aromas, coupled with smooth tannins smelled great in the marinade and also paired well for drinking afterward.